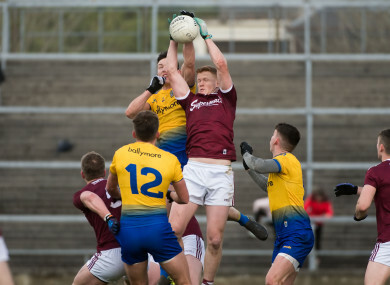 DANNY CUMMINS CAUSED huge problems for the Roscommon defence as Galway took a big step towards a league final slot with victory over Anthony Cunningham’s side at Pearse Stadium. Galway dominated this game from start to finish, and only a few brief spells from Roscommon, including Conor Cox’s penalty ten minutes after the break, kept their Connacht rivals in the game. But in the end the home side powered clear with Shane Walsh and Antaine Ó Laoí in top form, while Roscommon finished with 14 players following Niall Daly’s late black card. The windy and wet conditions were again troublesome for the teams at Pearse Stadium, and after a couple of wides from Roscommon, Galway settled into their game and got off the mark when Cummins cut in off the left and saw his goal bound shot tipped over the bar by Colm Lavin. Johnny Heaney’s shot crashed back off the post after seven minutes but Gareth Bradshaw scored off the rebound to put Galway two points ahead. But Anthony Cunningham’s side were playing well into the wind and their kick passing into space was causing problems for the Galway defence. A goal looked likely when Enda Smith tried to lob Ruairi Lavelle in the eight minute but the Galway goalkeeper got back to tip the ball over the bar, while Tadhg O’Rourke levelled matters a minute later when he broke through Galway’s defensive line. The pace of Antaine Ó Laoi saw him put Galway a point ahead before Ciaran Duggan also got his name on the scoresheet for the home side, and despite a rare score from Conor Daly, Galway started to pull clear. Shane Walsh curled over a brilliant point for Galway to put them 0-5 to 0-3 clear, while Gary O’Donnell stretched their lead soon after. Galway should have been much further ahead at that stage – Walsh missed the easiest of frees from 13 metres, Heaney was denied a goal by Lavin, and Cummins had a shot come back off the post – and at the other end Roscommon stayed in touch thanks to a couple of Conor Cox points and a Donie Smith free. But two minutes from the break Cummins fired to the net after John Daly’s smart pass, which gave his side a 1-11 to 0-7 lead at half time. Galway started the second half brightly when John Daly and Walsh points, but after a Colm Lavin 45, Roscommon were thrown a lifeline when Shane Killoran’s shot was stopped with a foot block, and Cox converted the penalty. Galway responded with a free from Ó Laoí after Conor Daly pulled down Walsh – he wasn’t black carded – while Roscommon began to find scoring difficult at the other end and their wides tally hit double figures. Niall Daly was black carded late on as Roscommon finished with 14 players but this was a formality for the home side. Scorers for Galway: Danny Cummins 1-2, Shane Walsh 0-4 (0-3f), Antaine O’Laoi 0-4 (0-2f), Gary O’Donnell 0-2, John Daly 0-1, Gareth Bradshaw 0-1, Ciaran Duggan 0-1, Cein D’Arcy 0-1, Micheal Daly 0-1. Scorers for Roscommon: Conor Cox 1-4 (1-0 pen, 2f), Donie Smith 0-1 (0-1f), Colm Lavin 0-1 (0-1’45), Conor Daly 0-1, Enda Smith 0-1, Cathal Cregg 0-1, Tadhg O’Rourke 0-1. 22 Cein D’Arcy (Caherlistrane) for Flynn (72). 22 Hubert D’Arcy (Padraig Pearses) for Kilroy (63). Email “Walsh and Ó Laoí on form in Galway's seven-point dismissal of Roscommon”. Feedback on “Walsh and Ó Laoí on form in Galway's seven-point dismissal of Roscommon”.